Events throughout the world will celebrate, educate and inspire the general public and children about Space and its benefits to humankind during World Space Week this year. Please find a few key events highlighted below. You can also view the detailed event calendar. According to preliminary results of WSW2017 celebration worldwide, Saudi Arabia organized 1543 events which are registerd in the official World Space Week calendar. Other top countries are Pakistan, India, Mexico, Romania and Japan. These results are not final, as WSWA expects reports from more large event organizers, such as Airbus Defence & Space. Airbus covers UK, France, Germany and Spain. US State department released a video in eight (8) languages: English, Spanish, French, Chinese, Portuguese, Russian, Arabic and Urdu specially for the commemoration of World Space Week 2017. Lockheed Martin is putting together a unique opportunity for students to tour National archives, explore NASA Goddard Space Flight Centre or even hear from the United States president, discover Virtual Education Field Trips and lots more and it is all free in support of World Space week 2017. The Mexican Space Agency promotes cultural space activity for youth, hosts a Symphonic Space Concert and more to celebrate World Space Week 2017 in Mexico. To celebrate 25 years of Belgians in Space, the Belgian Nuclear Research Centre (SCK.CEN) will put together an event on the 6th of October 2017. The event will be held at Boeretang, Belgium. ESA ESTEC, Noordwijk, Netherlands, ESA’s technical heart in Netherlands announces its annual Open Day on Sunday, 8 October. Cunard flagship line, Queen Mary 2, observes space during the World Space Week with an extraordinary Transatlantic Crossing from New York, USA to Southampton, UK. NASA Apollo 15 Astronaut, Col. Al Worden will be helping the UK celebrate World Space Week 2017 with an ‘Explore New Worlds’ tour of England and Wales, organized by Vixen International. The Bangladesh Astronomical Society will mark 2017 World Space Week in Enayetpur, Bangladesh with a string of events: street rally, water rocket launches, space art debate, space quiz and more. Arab Youth Venture Foundation, United Arab Emirate, will be putting up an ultimate road rally to commemorate World Space Week 2017. The event “Great Space Race & STEM Scavenger Hunt” is expected to attract hundreds of participants. Under the theme: Our Planet, Our Space, Our Time; the Blackrock Castle Observatory in association with Science Foundation and European Space Education Resource Office will hold over 100 events across 18 counties in Ireland to celebrate World Space Week 2017. 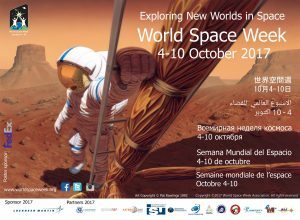 Dubai Astronomy Group , UAE will hold a week long World Space Week 2017 series of events scheduled to hold from October 4 2017. The events will include discoveries made by Cassini spacecraft to benefits of the Hubble Space Telescope. To kick off annual celebration of World Space Week, the Chinese Space Agency will make and distribute about 500 thousand copies of World Space Week posters. Planned World Space Week events are expected to attract about 45,000 participants including 25,000 Students across China. The Indian Space Research Organization will be celebrating World Space Week 2017. The event, which will include Space science exhibition and Space Program awareness lecture, will be held at KIIT University at Bhubaneswar, India. Space Foundation celebrates World Space Week at its Discovery center in Colorado Springs, United States. The event features former NASA Astronaut Lt Col Duane Carey. Latvijas Pasts, Latvia, celebrates World Space Week 2017 by releasing a new postal stamp and cover depicting Latvia’s first satellite. The Voyager: Going Interstellar Poster Contest commenced on the 4th of October and will accept poster submissions from participants worldwide until late October. The contest put together by Janet’s Planet is in celebration of World Space Week. World Space Week 2017 was, by far, the largest space celebration in history. The total number of events was around 3,800 in 80 nations. This compares to about 2,800 events in 82 nations in 2016. There were over 1,000 organizations participating. Map with locations of registered events in 2017 is here. Be part of the World Space Week family, celebrate WSW2018!